Depending on what time of year you plan to travel to the Reno and Tahoe region of Nevada, you're sure to find a variety of indoor and outdoor activities including winter sports, summer festivals, and fall events. The temperatures in the area range from extremely hot in the summer months to freezing in the winter, but nighttime is almost always chilly in Lake Tahoe and the high desert climate of Reno. No matter what time of year you decide to visit Reno or Lake Tahoe, you can look forward to great resorts, mountain adventures, tourist attractions, and plenty of opportunities for fun in "The Biggest Little City in the World" and the surrounding area. While many people assume Reno is hot year-round due to its location near several deserts, the city's altitude and proximity to the mountain range dividing Nevada from California create seasonal weather patterns for the region. Average temperatures can range from a low of 22 degrees Fahrenheit in December and January to a high of 91 degrees Fahrenheit in the hottest month of summer, July. Still, the area receives very little rain year-round, even in the winter months. 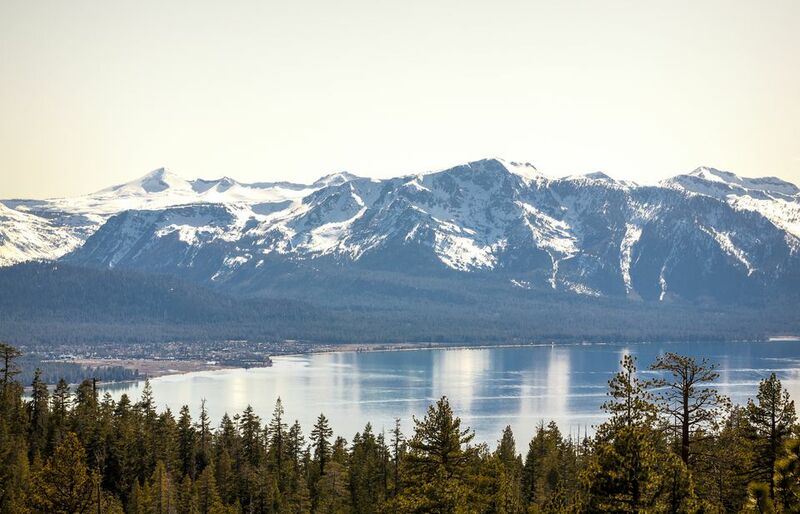 As the snow begins to thaw on the mountains near Lake Tahoe and Reno and the weather warms up across the region, the number of travelers dwindle but the number of events and outdoor activities starts to pick up. While April and May are still slightly chilly, especially at night, almost no rainfall occurs in early spring, making it ideal if you want to spend some time defrosting from winter outdoors. Although the daytime temperatures begin to climb in April and May, nighttime temperatures mean you'll still need to bring a sweater and possibly even a warm coat if you plan to be out after sunset. Late May and June are great times to go hiking and camping, so don't forget your gear and boots if you want to head up the mountains. The warmest, driest, and busiest time of year in Reno is summer, when kids are out of school and parents and single travelers alike take off work to enjoy some outdoor fun in the sun. Fortunately, Reno never gets too hot, even in July and August, and if you want to truly escape the heat, you can take a dip in Lake Tahoe, where temperatures never really climb above the lower 70s. Since summer has the warmest daytime temperatures, you should be especially cautious if you plan to stay out late as temperatures can drop as much as 40 degrees Fahrenheit between the hottest time of day and coldest time of night. Bring layers, long and short pants, and maybe even a light jacket if you're prone to being cold, but also pack your swimming trunks, t-shirts, and flip-flops if you want to spend the day at the beach of Lake Tahoe. One of the best times to visit Reno is early autumn, when temperatures stay between the 50s and 70s, though it is one of the rainiest seasons. Although most of the trees on the mountains near Lake Tahoe are evergreen, you can still cruise around to enjoy some changing colors in the foliage. Remember to pack a sweater and a raincoat, especially if you're traveling in November and December—Reno sees more rainfall toward the end of the season and into winter. Although it does get warm during the daytime, you won't likely need shorts or t-shirts since temperatures only reach up to the mid-70s in September and October. Whether you're staying in Reno or heading up the mountain to Lake Tahoe, you'll likely see snowfall at some point in time over the winter, especially in December and January, when the region is wettest. January through April are appropriate for skiing and snowboarding, and many vacationers come to the area for winter break to stay at famous mountain resorts. Surprisingly, you may need to pack fewer items of clothing for your trip to Reno in the winter. Although they are colder overall, temperatures fluctuate a lot less between nigh and day, meaning you won't need to pack layers as much as you'll need to pack warm clothing like sweaters, scarves, and coats. The lake effect and rain shadow are two weather patterns that have significant impacts on overall climate and daily weather conditions in the Reno area. The rain shadow effect is responsible for Reno's desert climate, where wind currents keep moisture-dense clouds from drifting into the region. Meanwhile, you can actually see significantly more precipitation coming down just west of town in the Sierra Nevada, which is not affected by rain shadow. The huge body of water known as Lake Tahoe affects local weather with a phenomenon known as the lake effect. When conditions line up just right, storms passing over Lake Tahoe pick up extra moisture and bring it over to the Reno side of the mountains, which can result in occasional storms with heavy rainfall or snowfall in the area. Who Will Be Reno's Next Mayor?